The threads were fine silk, cotton skeins and metallic gold. Started the embroidery with medium blue silk thread- chain stitch and herringbone. Darker blue silk thread for inner row of chain stitch and double herringbone filling. Green cotton skein for chain stitch on stem, leaf stitch. White silk thread used for chain stitch. Finally chain stitch embellishing was done with gold metallic thread. These Indian stoles[ dupattas] are quite long- 2.5 metres. They need to be worn over both shoulders, otherwise we’ll be sweeping the ground stylishly! 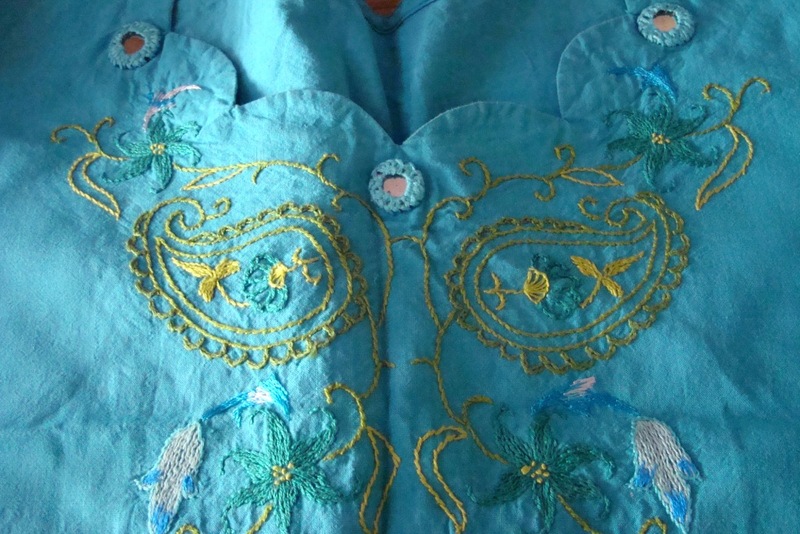 This embroidery was worked in the centre just below the neck, where it can be seen. A small motif with all the colours on the duppata seemed ideal. This pattern works well for Aari work too. Queenie requested to see the embroidered tunic with dupatta. 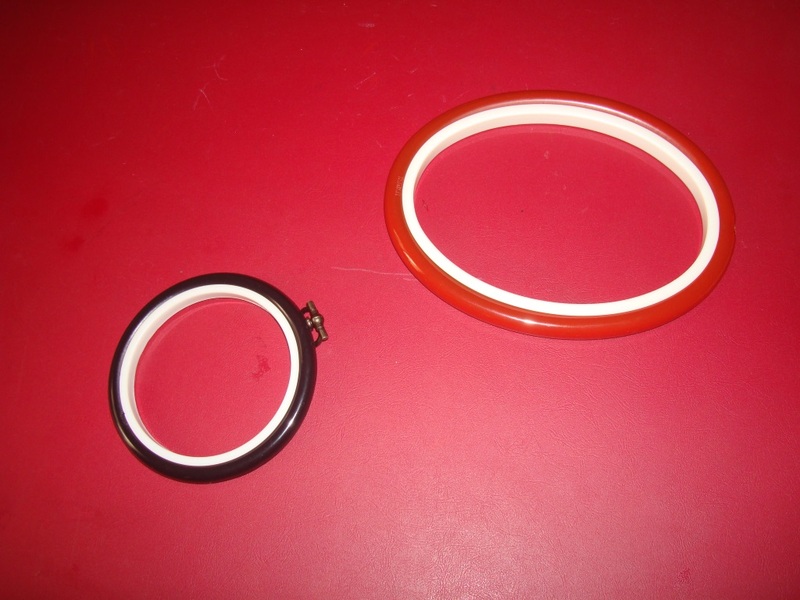 I use these plastic loops for embroidery. Remove them when they are not in use. With this detail the yoke design is complete. The length of the yoke is 18 inches. The neck is not part of the design. Whenever I work on these type of traditional designs, I generally cover the area with embroidery and embellishments . 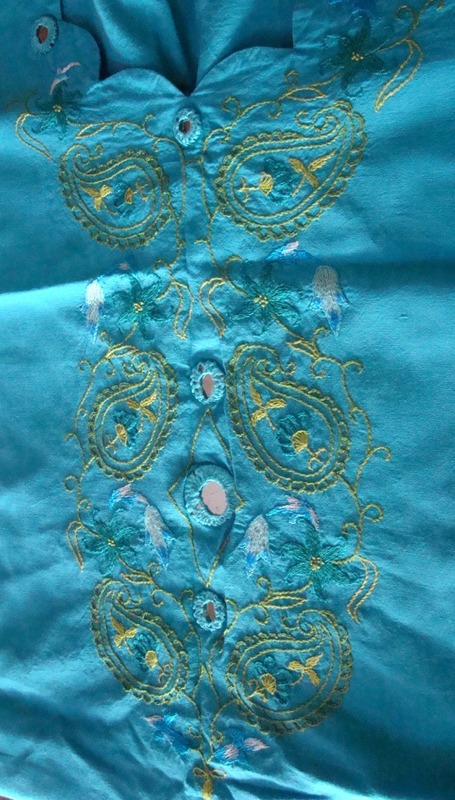 But for this design, embroidery was worked on the traced lines only. Mirrors were the only addition. 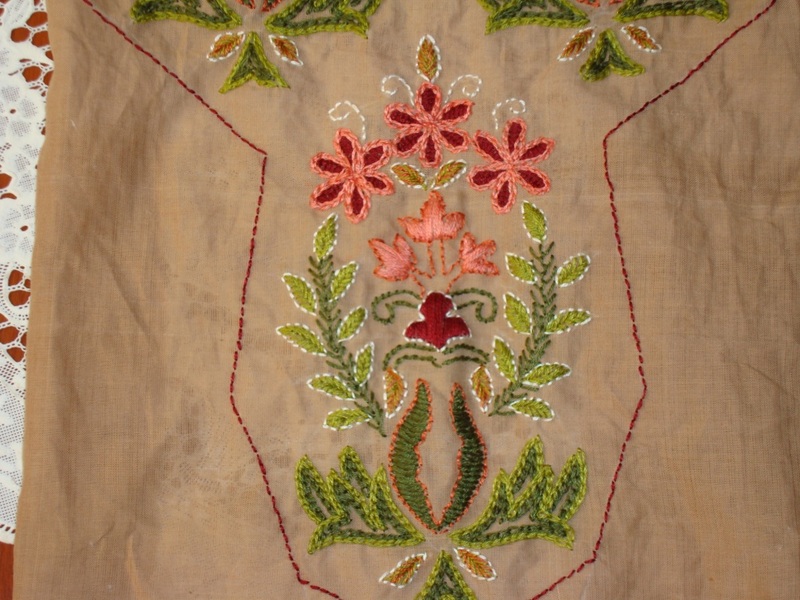 The embroidery was used just to enhance the colours on this tunic. 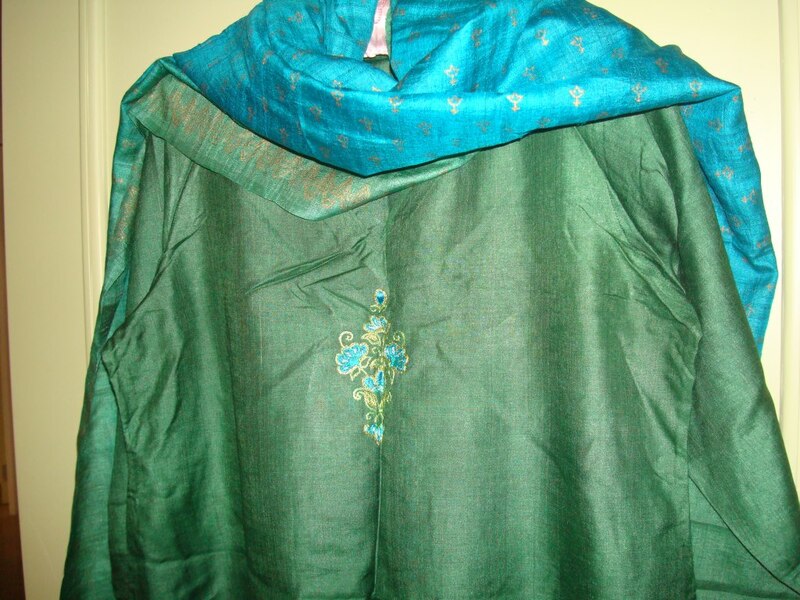 I wear a light green mercerized cotton salwar [Indian pants] for this tunic. I am fond of paisley designs, this pattern has 6 paisleys. This pattern would also work for –kashmiri embroidery,bead work ,kantha work and sequin work. In this tunic, the inspiration for the colours came from a kanjeevaram silk saree. The body of the saree was in blue, the border and pallu[ the part , which hangs over the shouder] were in light green colour. the border and pallu had zari woven all over. 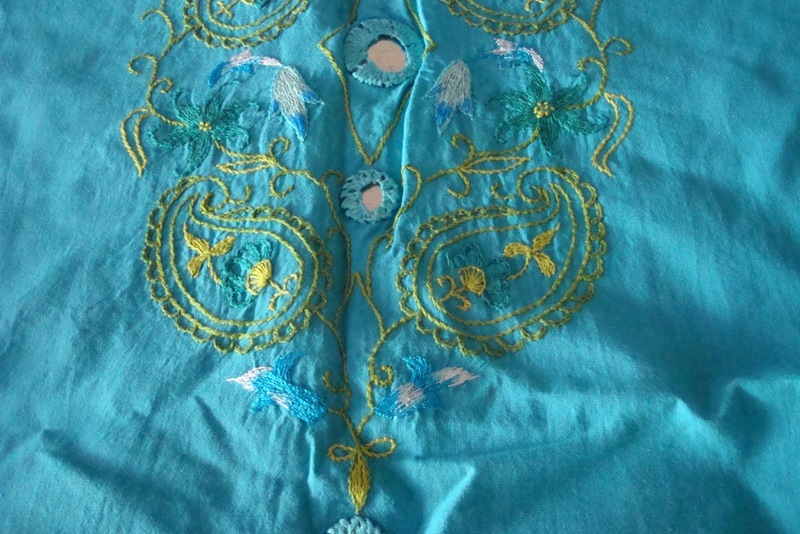 With the blue colour as the tunic fabric, the colour choice was- light green to lemon yellow, from white to medium blue for the embroidery. 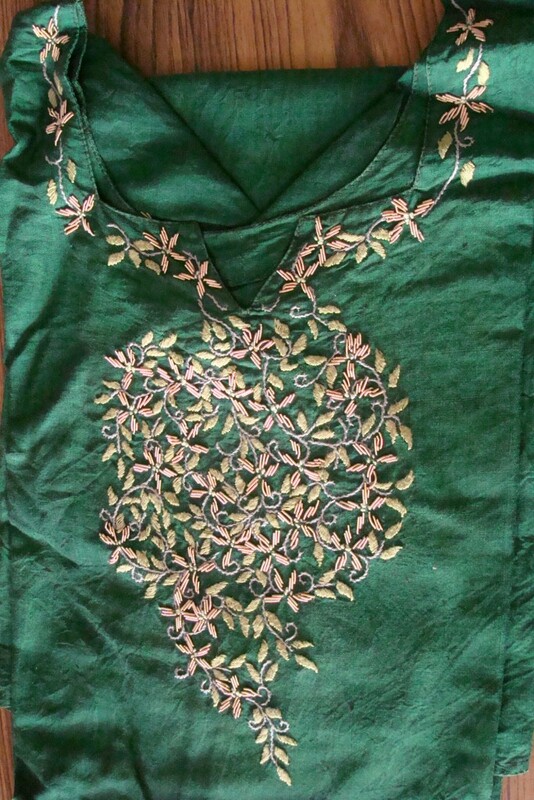 This tunic is more than five years old, this was the first time I used silk thread for embroidery. I have been using silk threads quite often after this. The complete yoke on my next post. I am a fan of Indian traditional designs. South India, where I come from, is also famous for kanjeevaram silk sarees. The colours of these silk sarees also captivate me. 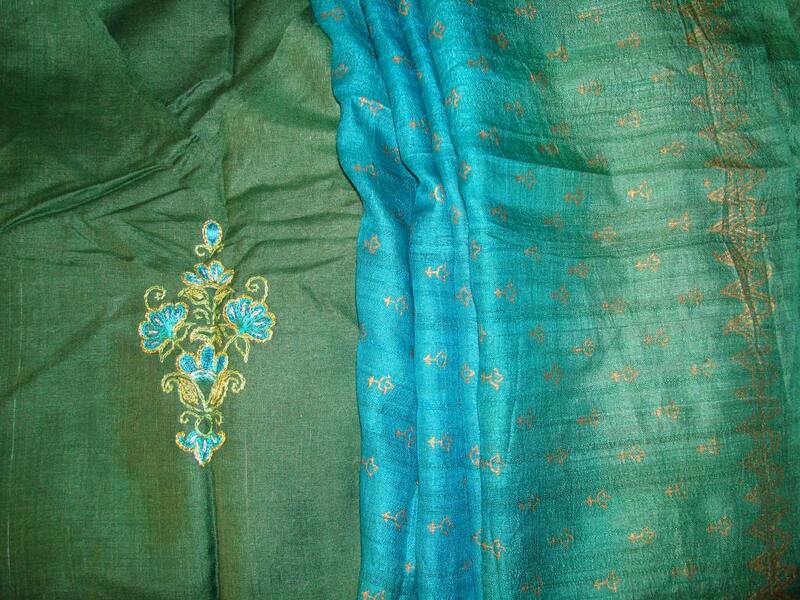 I liked this blue and green combination, which I thought would work well for tunic design also. 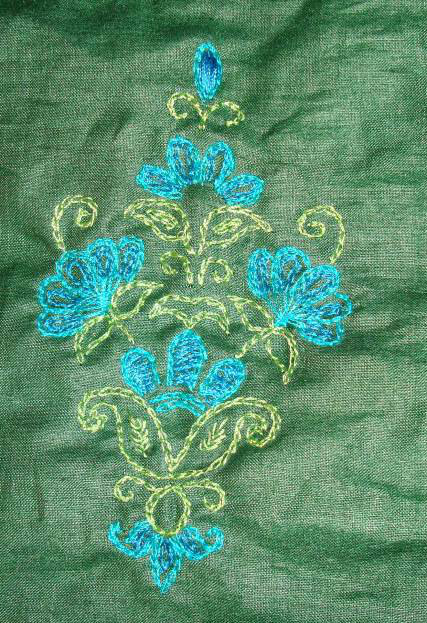 The pattern for this embroidered yoke is a combination paisleys, florals and mirrors. The stitches used were-chain, longand short, stem, buttonhole frenchknots and mirror work. The yoke design is spread over half of the front side of the tunic.I did not work on the sleeves. Will continue with the tunic on my next post. This is the first time I tried working zardosi embroidery. 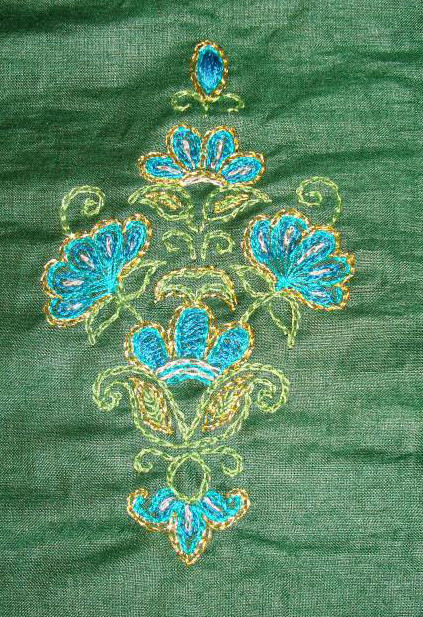 This embroidery is quite prevalent in north India and Pakistan. The embroidery is very old. I do not know whether it came during mughal period or before that. 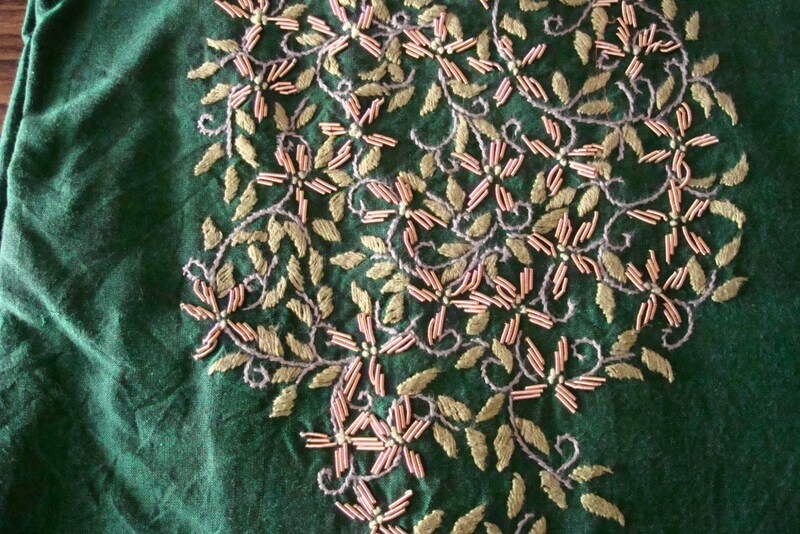 In this embroidery , metallic tubes[ I think, Lupions] are used to fill various shapes- flowers, leaves, paisleys etc,. Sometimes these shapes are outlined with threads , other times they are left as it is. 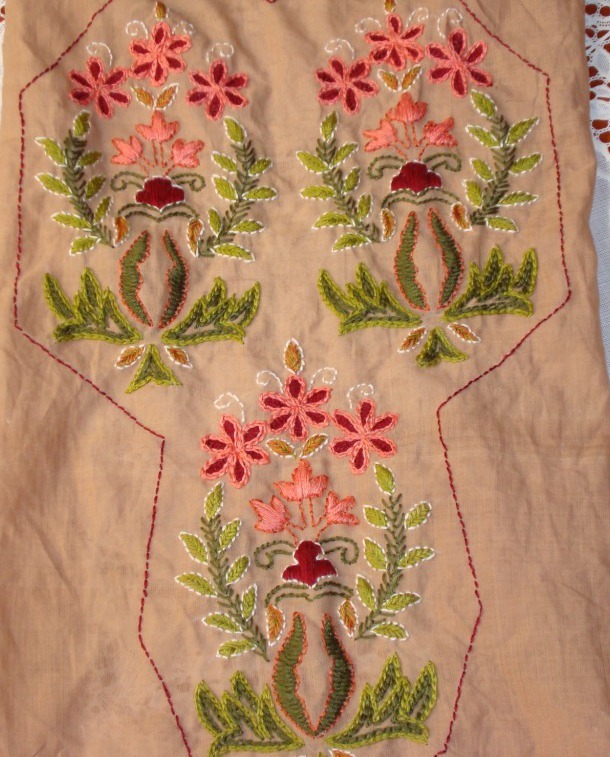 This embroidery is worked on wedding and other festive clothing.Men’s wear also are embellished with zardosi. The embroidery patterns are generally, florals, geometric shapes. 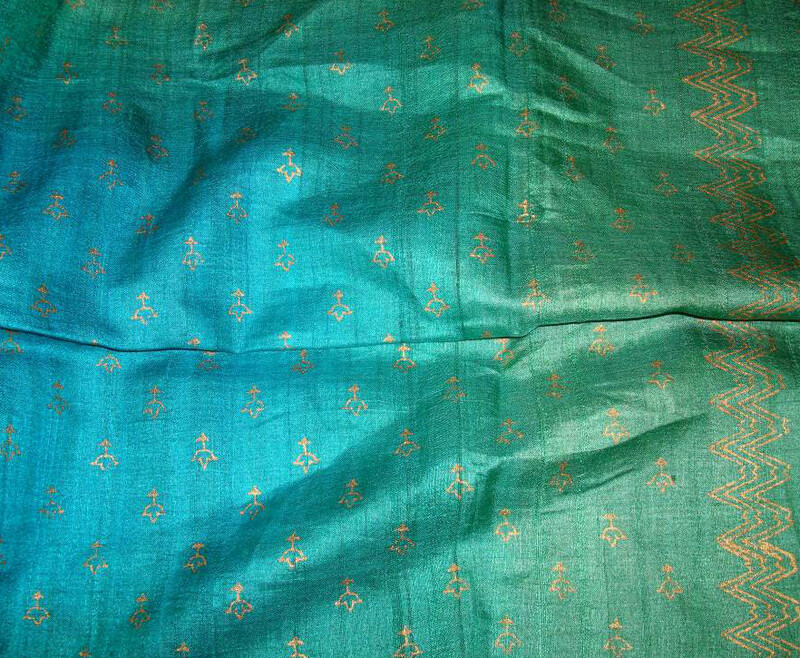 The embroidery is done in aari work, the metallic tubes are stitched by hand. the work is quite time consuming. So they are costly also. These days , there are lots of commercially done pieces , which are easily available. The embroidery done on them are not of good quality, especially the work done on sarees and lehengas.the fabric used is also very cheap. When I wanted to do this embroidery, the lupions were not easy to buy, I got these from Hyderabad, near Charminar. With the materials in hand I started with a medium sized paisley motif with neck design. 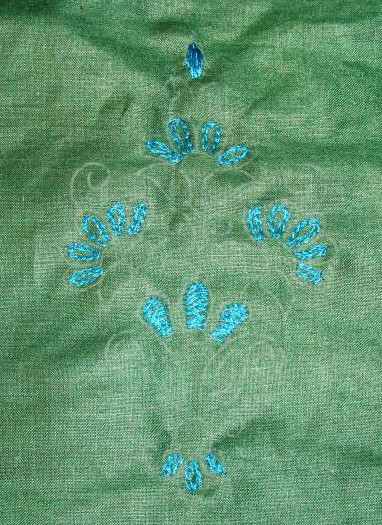 The tunic fabric was mercerized cotton in green colour. 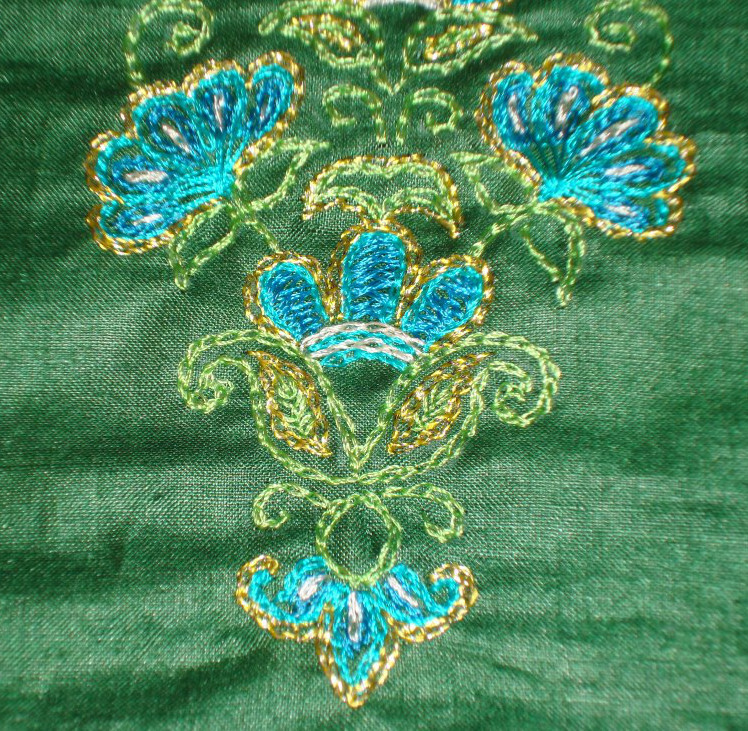 The embroidery was done in light green for leaves and very light green for stem. The flowers I worked in zardosi embroidery. I did not outline the flowers[ at that time I did not know that could be done]. 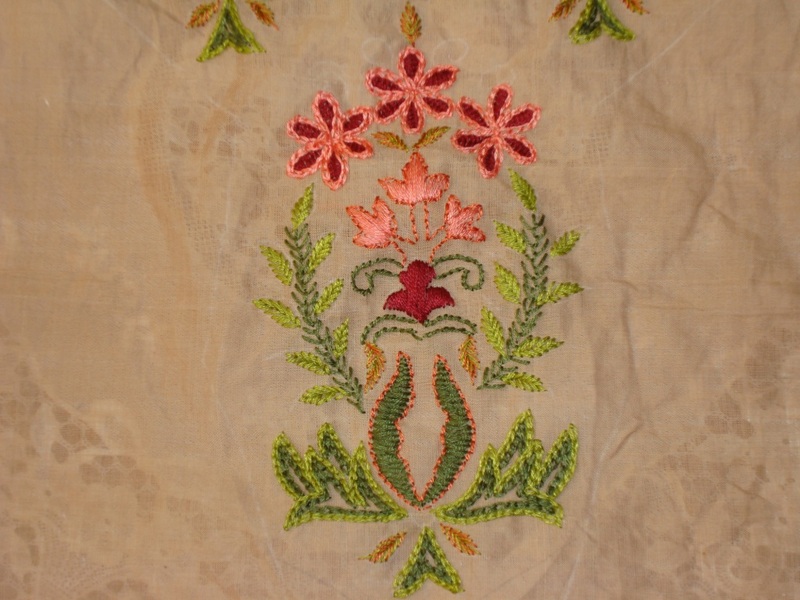 After looking at lots of zardosi embroidery pieces , now I have understood other aspects of this embroidery. Still, Iam in the learning process. And this tunic is also one of my favourites. 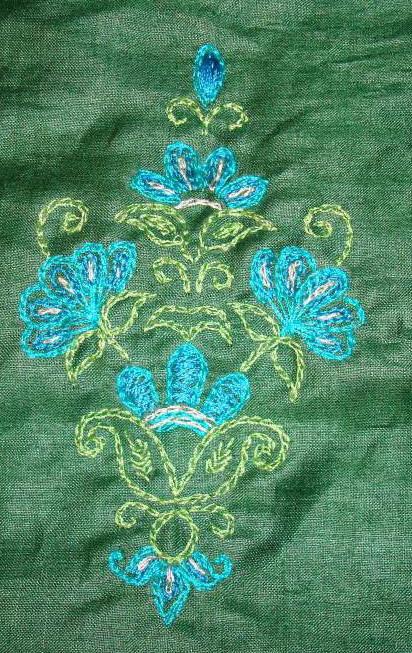 The last item that was embroidered on this motif pattern is the outlining in back stitch with cream thread. I thought I‘ll outline all the filling stitches in this motif pattern,. Few curves were also worked in back stitch. Thus the whole motif yoke is completed. 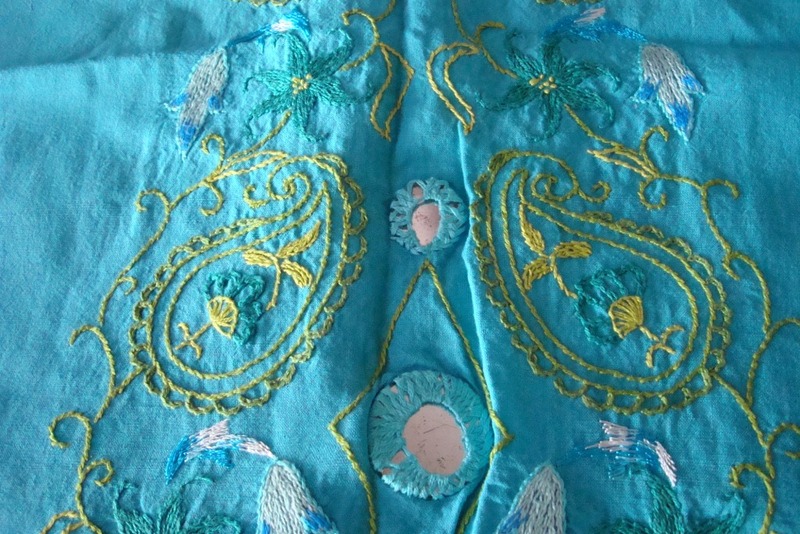 After completing this, I had gone to India, where I bought a few brocade materials for embellishing tunics. One of the material was in peach colour, since this motif has peach in it, I thought of attaching the brocade to the tunic . 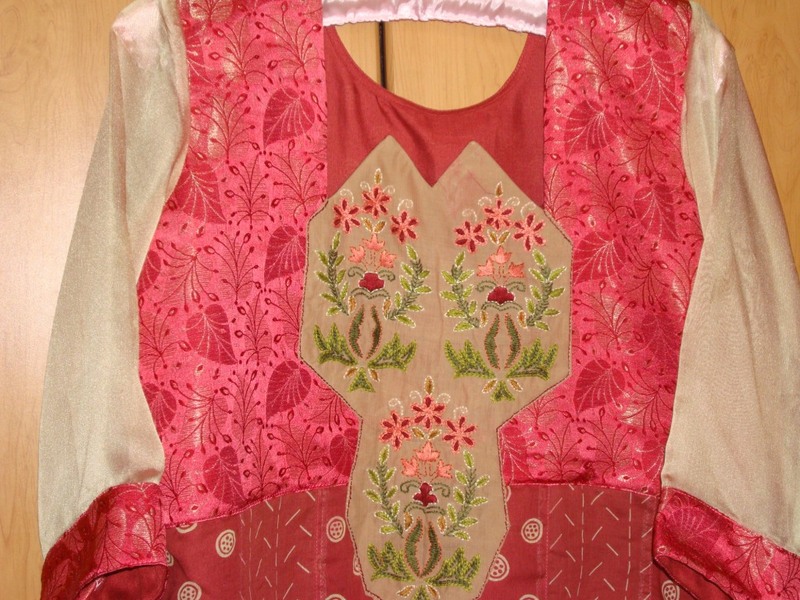 The idea was to stitch the tunic with alternate panels with the tunic fabric, attach a chiffon fabric for the sleeves with brocade border, attach the yoke with the brocade fabric outlining the yoke. The tailor also had an idea of lining the body part of the tunic,and so with so many layers- lining, tunic fabric , brocade , the yoke, the tunic is very thick and heavy, but the sleeves with the chiffon[without any lining], is kept intact only with the weight of the brocade border. The tunic looks pretty funny, and definitely Iam not laughing! 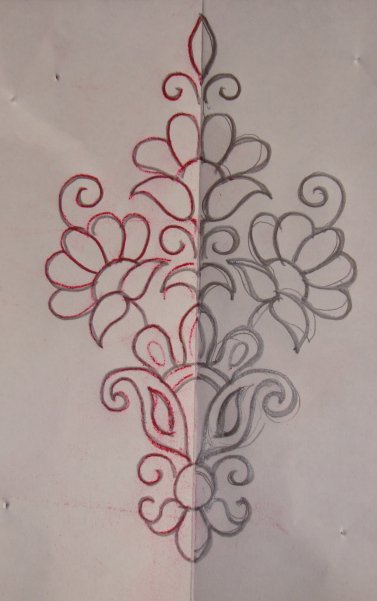 Lessons- If Iam doing motif patterns for yoke, they have to be arranged in a different manner. The embroidery work and thread colours should have been bold not subtle for this pattern and colour. 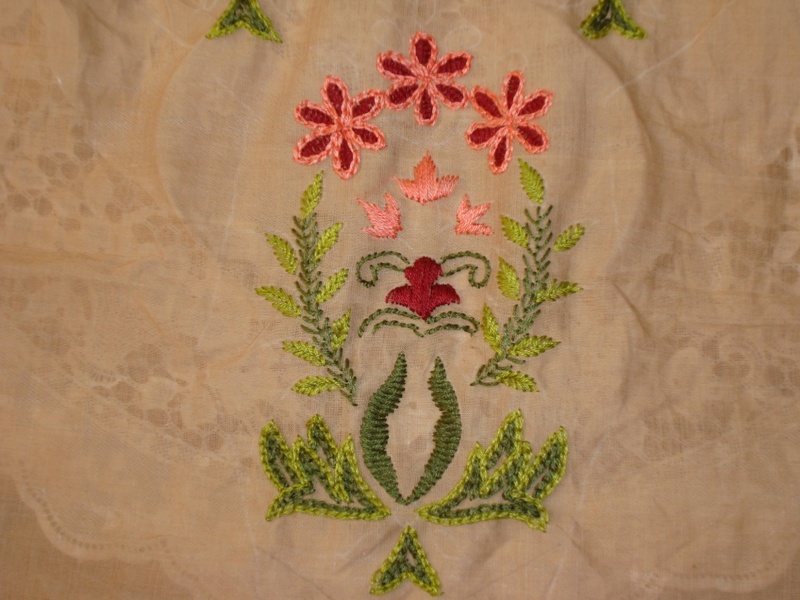 Here, the flowers are outlined with peach thread, the same peach is used for the satin flowers too. Generally with brown, maroon and green combination,I choose yellow colour. This time the peach was chosen. The yellow was not completely left out, I used variegated silk thread[ which has yellow in it] for the extra leaves in the centre. 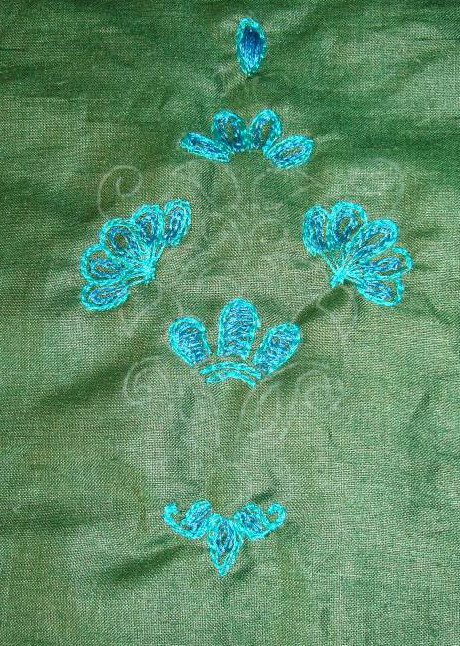 Peach satin flowers and dark green petals are outlined in back stitch with copper colour thread.